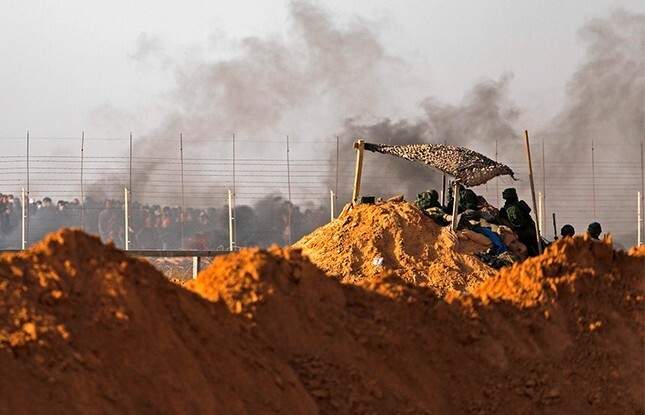 Israeli troops killed nine men and injured more than 1,000 in the second mass protest in a week along Gaza's border, as Palestinians torched piles of tires to create a smoke screen to block the view of snipers. Friday's death brought to 31 the number of Palestinians killed by Israeli fire over the past week, including 23 protesters. Gaza health officials earlier said 780 people were hospitalized Friday, but did not provide details on injuries. Riyad Mansour told reporters at U.N. headquarters in New York late Friday that one child is among the dead and a large number of children were injured, at least 48 according to one report. He said his information comes from Health Ministry and Red Crescent officials in Gaza. Mansour condemned "these massacres in the strongest possible terms" and demanded a halt and an independent investigation. The Arab League's U.N. Ambassador Maged Abdelaziz echoed his condemnation and demands. Kuwait's U.N. Ambassador Mansour Al-Otaibi, the Arab representative on the Security Council, said a press statement has been circulated to members, almost identical to one blocked last week by the United States, that among other things calls for an independent and transparent investigation. The deadline for objections is 6 p.m. EDT. In remarks clearly aimed at White House envoy Jason Greenblatt, Mansour denounced a statement that condemned Palestinians for calling for violence and sending protesters to the Gaza-Israeli border but never mentioned Israel's "behavior" or urged restraint against firing on civilians. "Shame on those who issue such statements, and they are totally on the side of the Israelis and condoning their behavior," Mansour said. Friday's march was the second in what Gaza's Hamas rulers said would be several weeks of protests against a decade-old border blockade of the territory. Israel has accused the Palestinian group of using the protests as a cover for attacking Israel's border, and has warned that those approaching the fence put their lives at risk. Sinwar told the crowd that the world should "wait for our great move, when we breach the borders and pray at Al-Aqsa," referring to the Al-Aqsa Mosque. The U.N. human rights office said Friday that it has indications that Israeli forces used excessive force against protesters last week.